Greetings citizens of this great Gotham City, it is once again “Batman Day” and if this is completely new to you then welcome to the party. This event started last year during the Caped Crusaders own 75th Anniversary and I thought it was pretty cool since they were giving out free Batman masks and comic books at participating comic book retailers and specialty shops. 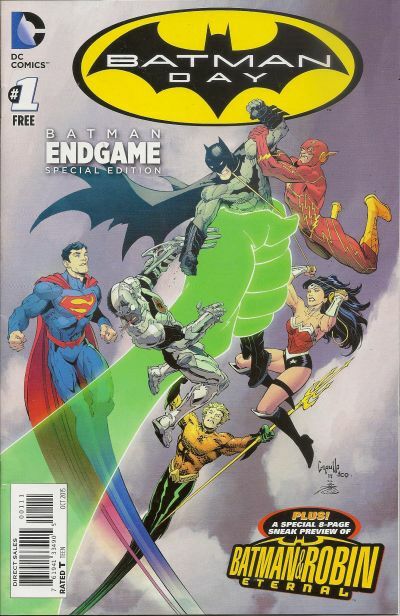 This year you can get yourself a shiny copy of the comic book that you see presented below which not only gives you an action packed story in “Batman Endgame” but also gives you a few pages look inside the upcoming “Batman and Robin Eternal” comic book that should be on the stands in the coming months. We’re getting this post online nice and early because the early bird gets the worm or in this case the freebie comic book. I am unsure if there is anything else being offered this year and I think we might only be getting the comic book which is still not a bad thing when you consider that an issue of this size would normally run you about $3.00; This is open as long as supplies last and once they are gone you will have to hit eBay or something similar I guess. PiercingMetal Thoughts: I’ll be heading down to the Park Slope store for Galaxy Comics this time around since they don’t get too many visits from me around these times. If you are in the vicinity you should do the same or hit the Bay Ridge store. Then depending on time I might trek out to Midtown Comics to see what is what. Get your cape and cowl and show us your best “Batusi”. That’s all for now. Today is “Batman Day” and like we saw happening in 2014 when this first happened, it will be a special event at participating comic book retailer and specialty shops. Fans can expect free comic books and activity kits dedicated to the Caped Crusader so find out what your local shop is planning so you are well aware to get the most of it.